Wire Photo from William Randolph Hearst's, San Francisco Examiner. 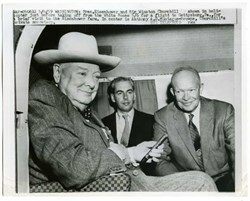 Offered is an original wire photo picturing British Prime Minister Winston Churchill and President Eisenhower. The pair are photographed in the White House helicopter headed for Gettysburg, PA. Churchill's private secretary, Anthony A.D. Montague-Browne, is seated between them. Great image with nice detail.